The NEW FRITSCH Knife Mill PULVERISETTE 11 is the ideal multifunctional, industrial-grade mill for very fast and gentle sample preparation of moist, oily and fatty as well as of dry, soft, medium-hard and fibrous samples for reproducible and meaningful analysis results in the fields of foodstuffs or animal feed testing and many other applications. Safe intuitive operation – exact analysis - easy cleaning! Versatile use – gentle fine grinding – simple working – easy cleaning - practical cryogenic grinding! The completely modified FRITSCH Vibrating Cup Mill PULVERISETTE 9 offers many practical advantages in all areas in which hard, brittle and fibrous material must be ground extremely quick down to analytical fineness. Especially for the analytical sector and applications in the food and pharmaceutical industry! Natural stones are considered the oldest building materials of mankind. Fine comminution and sieving in one unit! Medium hard to hard materials with edge lengths up to 95 mm can be pre-crushed with the FRITSCH Jaw Crusher PULVERISETTE 1 so an additional fine comminution with many FRITSCH mills is possible. The Disk Mill PULVERISETTE 13 classic line is our recommendation for all processing laboratories with a continuous delivery of brittle to very hard materials for batch or continuous fine grinding. The FRITSCH Variable Speed Rotor Mill PULVERISETTE 14 premium line offers impact, shearing and cutting comminution in one instrument – with a higher performance, better cooling and significantly quieter than comparable instruments. For the tenth time the Huber publishing house for Neue Medien GmbH (New Media) selects outstanding companies from the industry for the INDUSTRIEPREIS (industry award) within the time period of the HANNOVER MESSE. Video: How the FRITSCH Cutting Mills work! During the annual trade fair EUROLAB in Warsaw the new Particle Sizer ANALYSETTE 28 ImageSizer secured an award in the Best Products competition. The premium version with very high throughput - EXTRA POWERFUL. EXTREMELY ROBUST. EASY TO CLEAN. FRITSCH Planetary Mills classic line are most effective for rapid loss-free and reproducible ultra-fine grinding of hard, medium-hard, brittle and fibrous materials dry or in suspension, for mixing and homogenising as well as for mechanical alloying/activation in materials research. Samples can be processed from a few milligrams to several kilograms at a wide range of fineness levels down to less than 1 μm. They are absolutely reliable, especially easy to operate and clean. Matching grinding parts of various materials are also available to provide maximum protection against undesired contamination of the samples. Ideal for size reduction of soft to medium-hard, tough-elastic and fibrous materials as well as for heterogeneous mixtures. Simple operation – fully automatic measurement, analysis and cleaning! Measuring Particle Shape and Size with Dynamic Image Analysis! The premium model of the FRITSCH Disk Mill for efficient fine grinding of hard-brittle to medium-hard solids: Even more powerful and safer due to automatic locking of the collecting vessel and grinding chamber, even easier to operate due to digital gap display and presentation of all parameters on a well-designed display. Ideal for medium particle sizes in the areas of mining and metallurgy, glass industry, ceramics industry, soil research, rocks and soils. Overview of the premium features: premium, easy reproducible gap width setting with digital gap display.. Discover with the FRITSCH premium line a completely new dimension in high-tech milling. In the food industry the trends of the future are Healthy Nutrition and Convenience Products. FRITSCH Laser Particle Sizers: Simple. Flexible. Reliable. 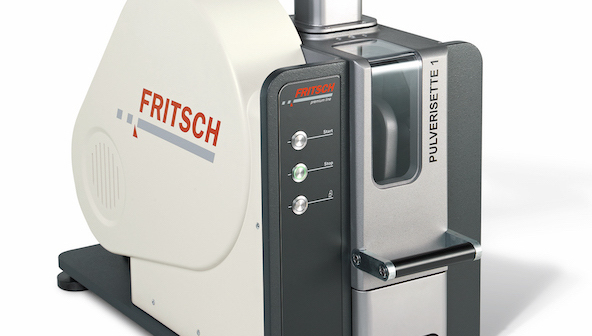 The FRITSCH Vibratory Micro Mill PULVERISETTE 0 is the ideal laboratory mill for fine comminution of medium-hard, brittle, moist or temperature-sensitive samples – dry or in suspension – as well as for homogenising of emulsions and pastes. Convenient – Precise - Reliable! Benefit from their decisive advantages: extremely simple operation and short analysis times for consistently reproducible and reliable results. New Pellet Press from Fritsch Aug 13, 2012 Ideal for the preparation of high-quality pellets! New Vibrating Cup Mill – now with higher grinding performance and Pellet Press Jul 11, 2012 Stronger. Faster. Better! New AutoSampler and Small Volume Wet Dispersion Unit for the Laser Particle Sizers ANALYSETTE 22 Jun 14, 2012 FRITSCH Laser Particle Sizers: Simple. Flexible. Reliable. Worldwide the Laser Particle Sizers ANALYSETTE 22 ensure precise determination of particle size distributions, by Static Laser Scattering - in production and quality control as well as in research and development. Benefit from their decisive advantages: extremely simple operation and short analysis times for consistently reproducible and reliable results. Fritch are now extending their premium line by 4 additional new high-tech laboratory mills for various applications: functionally designed to the smallest detail, with interesting new features, latest technology, highest performance and maximum safety. FRITSCH Planetary Ball Mills – High-performance all-rounders in routine laboratory work! Feb 17, 2011 Ideal for fast and loss-free grinding from a few milligrams to several kilograms at a wide range of fineness levels down to less than 1 µm - dry or in suspension - absolutely reliable, easy to operate and to clean! Laser Particle Sizer ANALYSETTE 22 NanoTec – High-end instrument for particle size measurement down to the nano range Nov 21, 2010 FRITSCH Particle Sizing Instruments offer state-of-the-art laser technology for an unique price performance ratio, for each particular area of application and utilization. An extra plus: the special, patented FRITSCH measuring method by laser diffraction inside the convergent laser beam. Your advantage: a simple continuous adjustment of the measuring area as well as up to now unknown number of measuring channels. Disk Mill PULVERISETTE 13 Nov 9, 2010 Our recommendation for all processing laboratories with a continuous delivery of brittle to very hard materials for batch or continuous fine grinding. The maximum feed particle size is approx. 20 mm edge length. The fineness attainable (d50) is down to approx. 12 mm (largest gap width) or 0.1 mm (smallest gap width). MORTAR GRINDER – The essential instrument in the processing laboratory – NOW with illuminated grinding chamber Oct 6, 2010 The Mortar Grinder PULVERISETTE 2 is the essential instrument in the processing laboratory. It is equally suitable for universal fine grinding of inorganic and organic samples, dry or in suspension for analysis, quality control and material testing, as well as for the production and homogenizing of pastes and crèmes in a laboratory standard. Jaw Crusher PULVERISETTE 1 - the compact pre-crusher Sep 3, 2010 The compact FRITSCH Jaw Crusher PULVERISETTE 1 is the ideal instrument for fast and effective pre-crushing of hard and very hard brittle materials - even ferrous alloys are no problem for this instrument! Choose according to your tasks: two different models for various feed sizes and sample quantities are available. While you are still manipulating the screws on other mills, your FRITSCH Cutting Mill is already clean! Jul 1, 2010 Available only with FRITSCH Cutting Mills: All grinding parts can be removed for cleaning in just a few seconds without tools - unbeatable fast, simple and efficient! This makes them ideal, time-saving assistants in the comminution of fibrous and tough materials, plastics and heterogeneous mixture of materials and for sample preparation for RoHS and WEEE analysis. FRITSCH Planetary Mills – Worldwide Standard in the Lab Jun 3, 2010 FRITSCH Planetary Mills classic line are the most effective laboratory mills for rapid loss-free ultra fine grinding down to colloidal fineness of hard to soft materials dry or in suspension. In addition to Comminution, you can also use them for mixing and homogenising of emulsions and pastes or for mechanical alloying and activation in materials research. Precise Analysis – Thanks to FRITSCH Rotary Cone Sample Divider – LABORETTE 27 May 5, 2010 Today modern analytical instruments for particle characterisation can achieve previously unheard-of levels of precision. Verification limits of trace analy­sis in the p.p.m. (parts per million) or p.p.b. (parts per billion) range have now become standard. Vibrating Cup Mill – extremely fast grinding! Apr 7, 2010 The FRITSCH Vibrating Cup Mill PULVERISETTE 9 is indispensable for all areas in which hard, brittle and fibrous materials must be ground extremely quick down to analytical fineness. As the world‘s first mill of its kind, it has a frequency transformer control developed by FRITSCH. New, high-quality sieve tensioning system for your Sieve Shaker – calibration according to ISO 9001 Mar 8, 2010 In today's research or control labs, sieving analysis must be conducted and documented much more accurately and reproducibly than in the past. ISO 9001, laboratory certification, EC safety directives, stricter in-house quality standards, etc., now require measuring and test equipment which can be calibrated and validated, boasts complex software and achieves precise results. DynaSizer ANALYSETTE 12 – A NEW DIMENSION! Mar 8, 2010 The new ANALYSETTE 12 DynaSizer uses the Dynamic Light Scattering as a measuring method and therefore enables the measurement of particle size distributions between 1 and 6000 nm. Perfect solution for dry measurement of particle size distributions! Feb 17, 2010 The Laser Particle Sizer ANALYSETTE 22 MicroTec plus, is an universally applicable instrument for the determination of the particle size distribution of powdery samples in an accelerated air flow. It is suitable for the utilization in quality and process control. Due to the highly flexible programmability of the entire dispersion and measuring process, it is also very apt for research and development. Planetary Mills premium line – a completely new dimension in size reduction Feb 10, 2010 Extremely efficient and fast grinding with maximum safety, highest convenience and novel grinding bowl locking - faster, simpler and safer than ever. FRITSCH premium line – the first planetary ball mill with sunken grinding bowls. Dec 11, 2009 Discover with the new FRITSCH premium line high performance planetary mill, a completely new dimension of high tech grinding: For the first time you will see a planetary mill with sunken grinding bowls.